Description: Party characters or costume characters add excitement to any event. Whether trying to attract customers to your place of business or having a children's birthday party, we have the character that's right for you. Imagine the face of your child when one or more of their favorite storybook characters come to life at their party. We offer different packages to choose from based on your needs. We are constantly adding new characters for you. 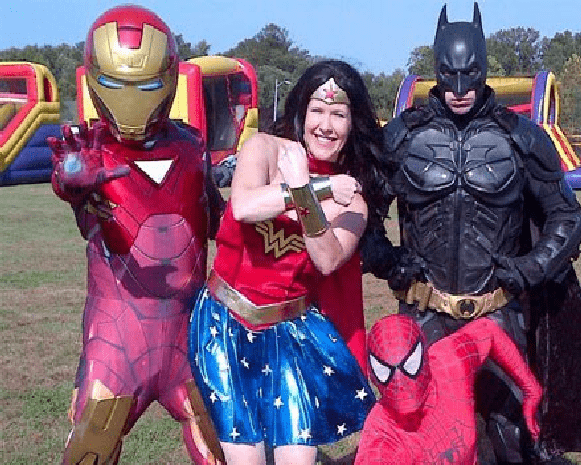 Characters include: Iron Man, Batman, Superman, Captain America, Princesses, Indiana Jones, Princess Leia, Darth Vader, Alice in Wonderland, The Mad Hatter, Raggedy Ann & Andy and Holiday Characters. Custom Characters Upon Request.